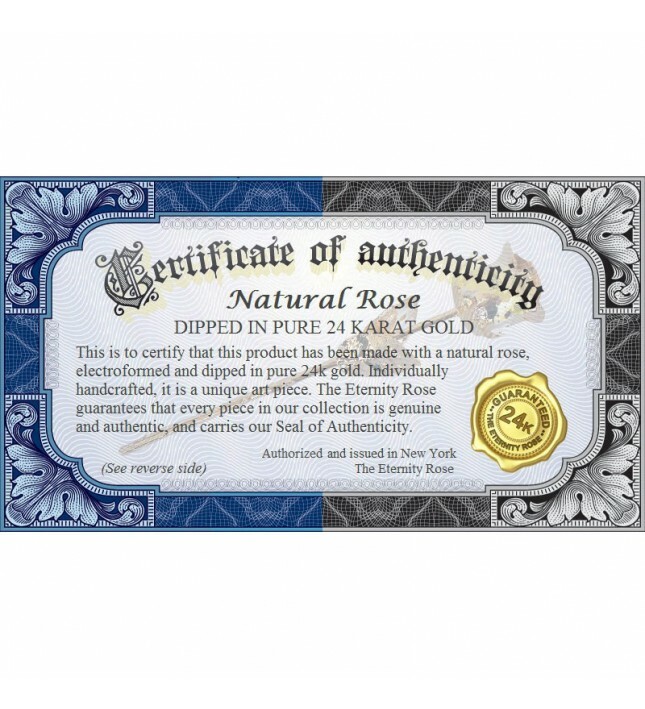 • A real rose that has been dipped in 24K gold. • An exquisite Valentine's gift for her. • Ideally twinning the splendour of a single rose with the glamour of gold. 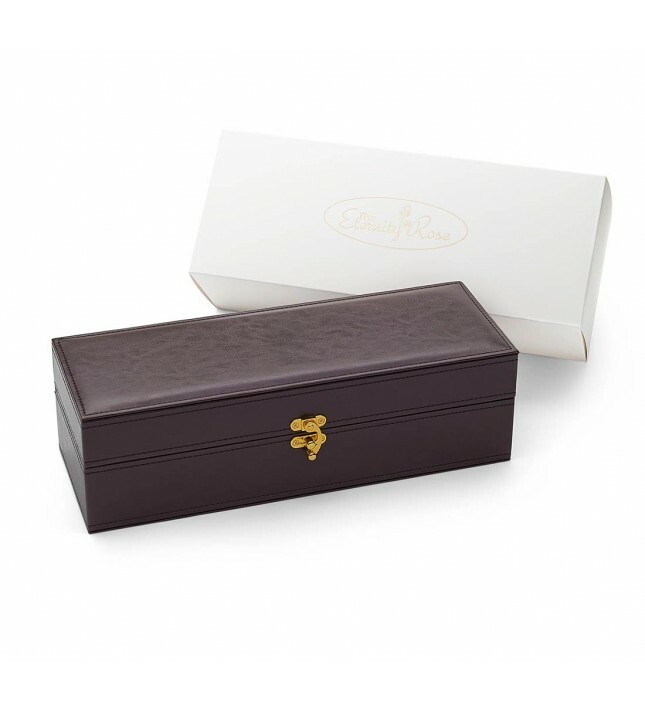 • Each rose comes complete with an authenticity certificate and is presented in a stylish leather case. 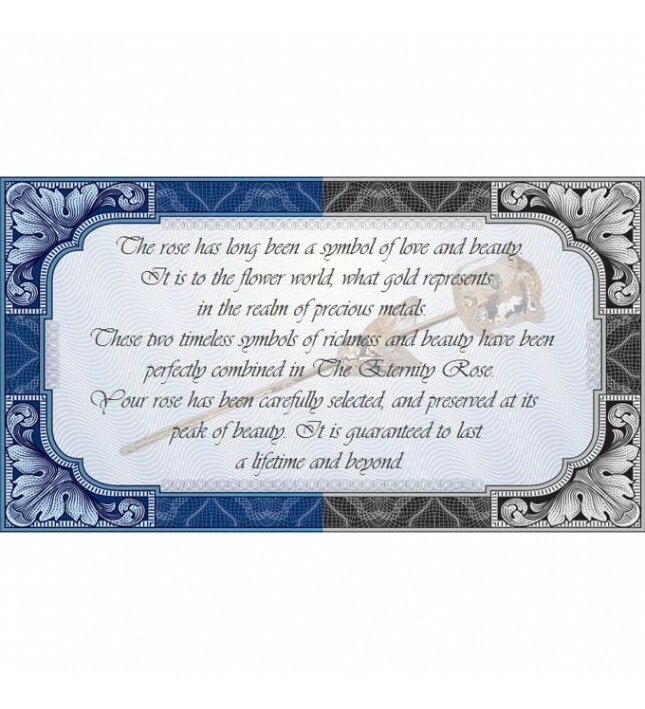 • With a gorgeous gold sheen, this rose is a memorable and meaningful gift that will endure forever. 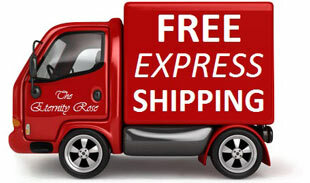 • All orders receive fast and free delivery. • Made from an actual rose that has been picked at the height of its beauty. • 24K gold-dipped (note that a carat is a measurement of jewellery weight whilst karat represents the pureness of gold). • A display case made of leather is presented with every rose. • An iconic symbol of romance. • With its quality lustre finish, each rose is a unique work of art. • The length is around 11.5". There are few symbols of love that are as well known as the rose. 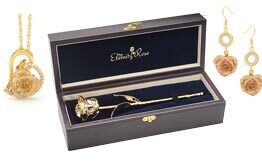 Famed in art and literature for its natural splendour, and standing as a token that represents passion and romance, the power of the rose is increased exponentially when it is coated in a precious metal and is presented to the love of your life as an enduring testament of adoration. 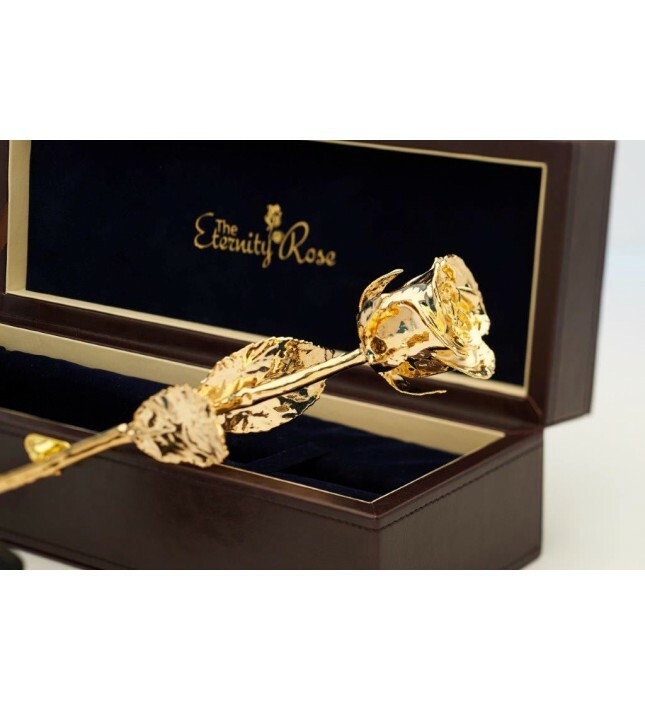 Lasting forever, any recipient of an Eternity Rose will be delighted to receive such a flawless and meaningful gift. 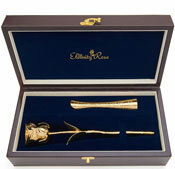 No matter whether it is for a birthday, an anniversary, for Mother's Day or Valentine's Day, any woman is sure to cherish a gold-dipped Eternity Rose. 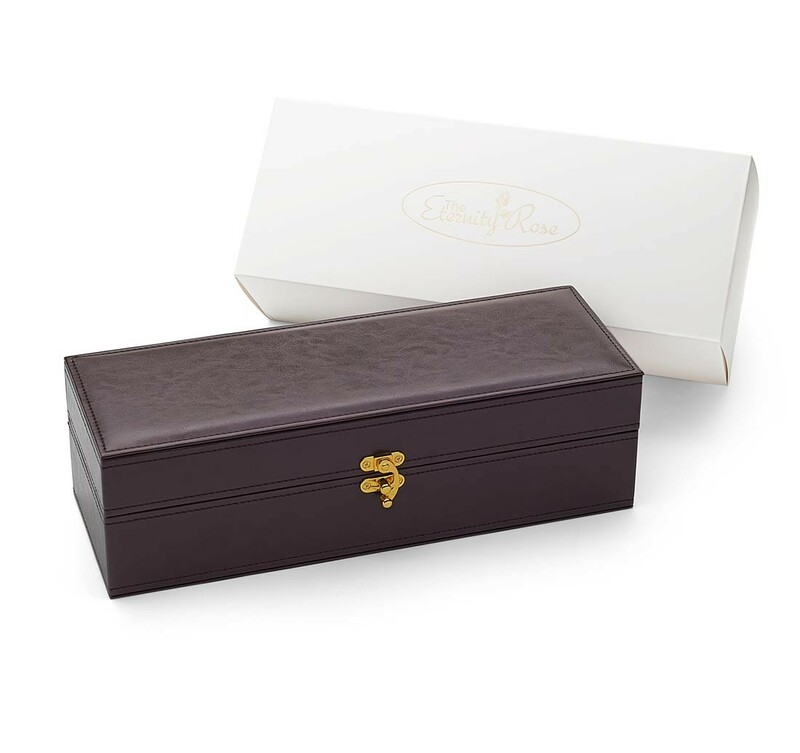 Making an ideal alternative to other more generic Golden Wedding gifts, it is the ideal way to demonstrate to any couple who have been married for half a century how much they mean to the giver. The impressive 24 karat gold-dipped Eternity Rose perfectly combines the beauty of nature with the luxurious feature of gold. If your loved ones are celebrating their 25th Silver Wedding Anniversary, you might want to give them one of our gorgeous roses dipped in silver. The single rose has long been known to be the ultimate expression of adoration, and few things express the deepest sentiments of the heart than a rose blossom. 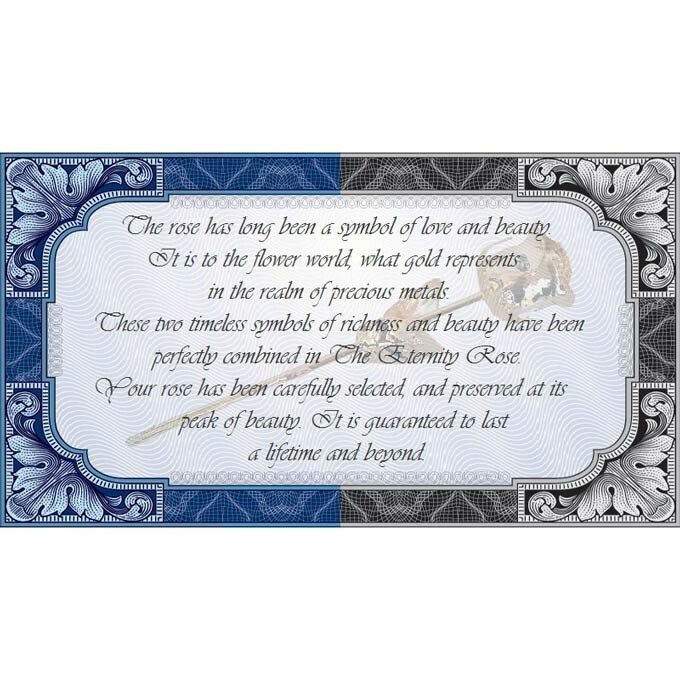 Now The Eternity Rose has taken this iconic symbol of love and transformed it into a fabulous art piece that will last as an eternal memento of your long-standing devotion. Every Eternity Rose is grown and cultivated in our own nurseries, tended by experienced and talented horticulturists who select every blossom for its own unique beauty. No expense is spared on selecting only the finest flowers, and every bloom is picked at the very moment that it starts to open. 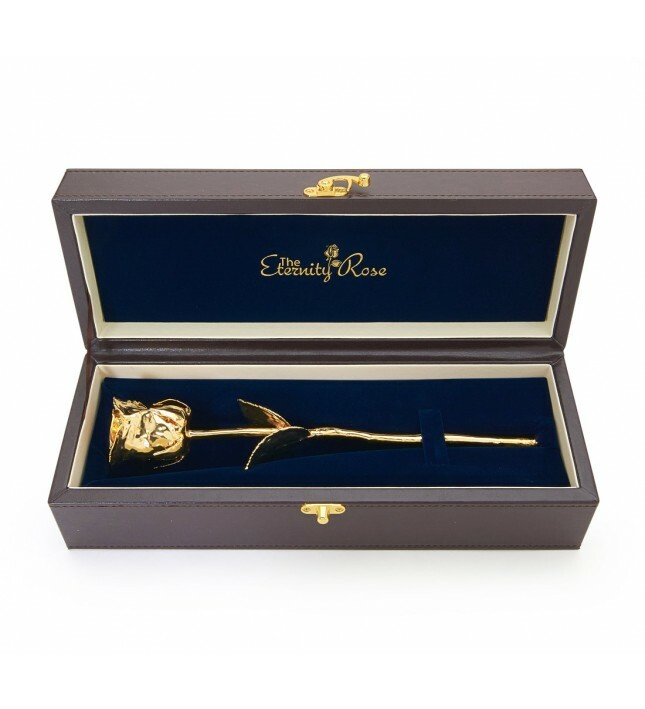 The rose is subsequently preserved in gold at the very height of its beauty. There is a complex 60-step procedure which every flower used by The Eternity Rose undergoes in order to produce a gorgeous work of art. 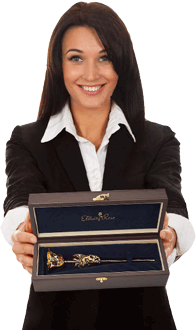 Over the course of nine years, we have honed and developed our techniques and procedures and therefore none of our competitors can come close to the perfection of our product. 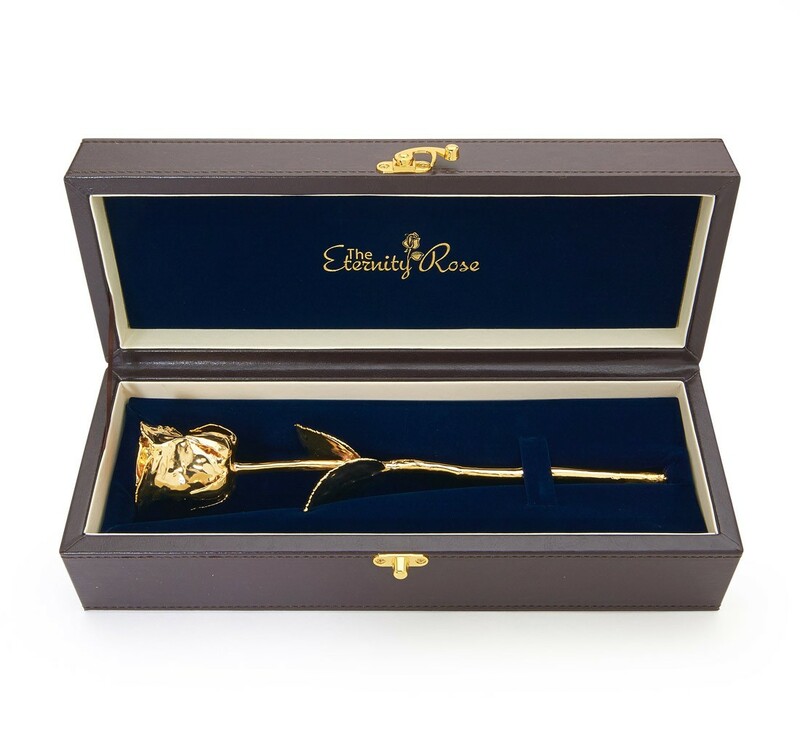 Our high quality roses are made using immersion electroforming with our patented formula that first coats the petals of the rose in pure copper as a base. 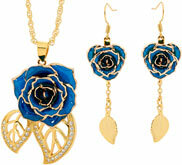 This preserves the integrity of the rose's natural structures and forms an ideal base for the precious metal coating. 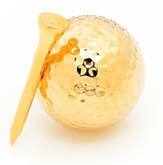 The rose is then layered in nickel which improves its strength and structural integrity. 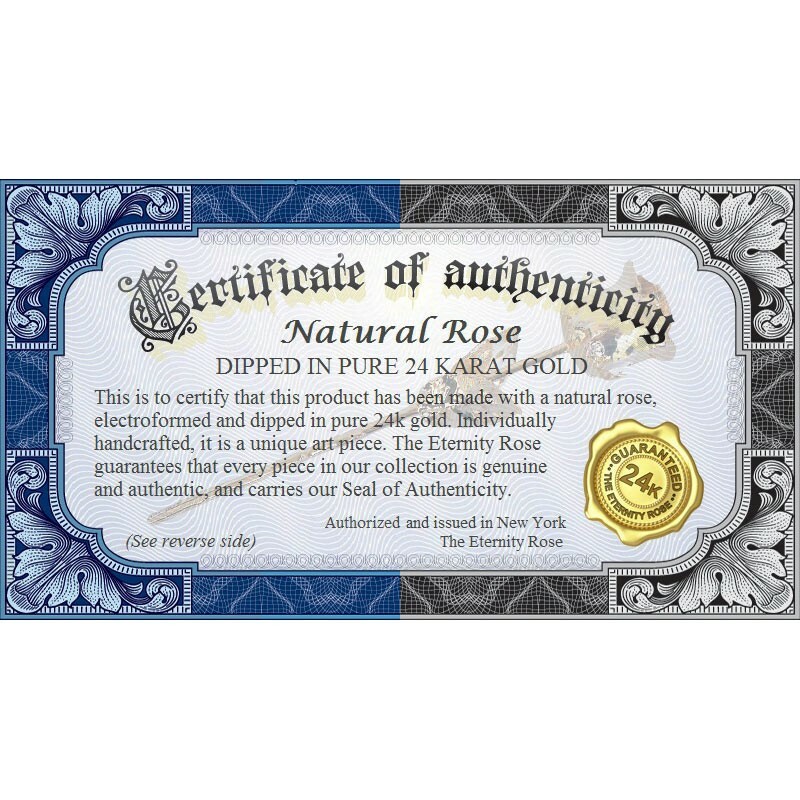 When applying each layer, we subject the rose to the most stringest quality control testing in order to check that the coating is flawless, and only once we are satisfied that each rose is perfect does it pass through to the concluding stage, being dipped in pure 24K gold. 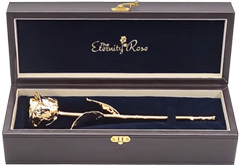 It takes weeks to complete the process of producing a finished Eternity Rose, with thin layers being added one at a time until the signature lustrous finish is achieved. After three months, the result is an incredibly impressive gift that will stand the test of time, with a stunning mirror finish. While real rose blossoms fade and die, the splendour of a gold-dipped Eternity Rose goes on for literally centuries and will never tarnish or deteriorate over time. It can therefore be displayed as a magnificent and lasting memento. 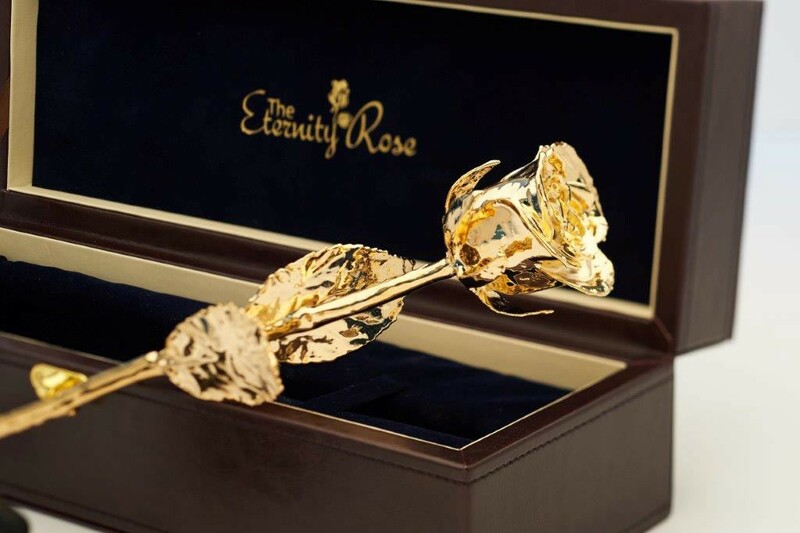 Declare the undying nature of your love when you present the gift of a beautiful gold-dipped Eternity Rose.